Systems Change Advocacy focuses on efforts affecting change in the Kern community for local, regional, and State government. Change happens through partnerships with consumers and community organizations. The ILCKC Systems Change Advocate brings inclusion and positive change to society for people with disabilities through education. Issues are addressed that are related to individuals with disabilities including, but not limited to, housing, transportation, access, employment, health, etc. 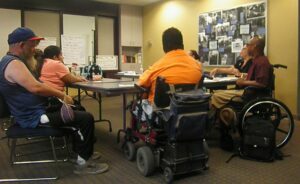 Team Advocacy is a group of individuals with different disabilities who meet on the third Monday of each month from 2:30 p.m. to 3:30 p.m. at ILCKC to discuss and address community concerns regarding people with disabilities. Consumers and the public are invited to attend these monthly meetings.